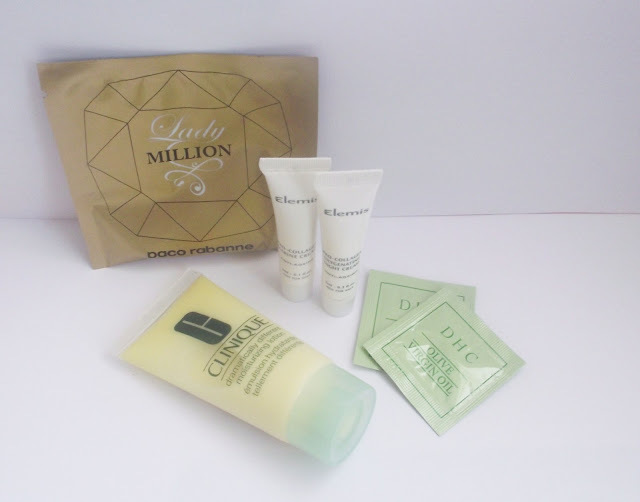 Beauty In The Mirror: Giveaway Time / NUXE Reve de Miel Lip Balm & extras!! Giveaway Time / NUXE Reve de Miel Lip Balm & extras!! Yay!! The time as finally come for me to hold a giveaway. I did promise a giveaway when I reached 1,000 which was a little while ago so after much thought I decided on a prize which I know you will be excited about. The much talked about NUXE Reve de Miel Lip Balm! I haven't tried this yet so am very jealous that one of you will wining this and trying it before me lol! I have also been out and picked up my Holy Grail concealer, this is great for correcting under eye circles and brightening the eye area. I will also be adding some little extras to the giveaway as well. (2) Please leave a comment below telling me what is your favourite Lip Balm! Giveaway ends midnight (GMT) 17th August 2012. Open to everyone, one entry per person please! Plus please remember to leave your email address or your twitter name so I can contact the lucky winner! One person will be selected by Random.Org. My favourite is blistex intensive lip balm! I like Nivea lip balm ! I'm a follower on GFC :) Congratulations on reaching 1000! I am following as Ria on GFC and my favourite lip balm is the EOS tangerine one. My fav lipbalm is the claire's one, with mango perfume! At the moment I am adoring Raw Gaia Vanilla Balm, keeping my lips lovely as soft. My favourite lipbalm ever is Burt's Bees honey lipbalm. my favorite is the korres lipbutter! My favourite is blistex med lips, I don't care much for the smell but it works amazingly. hi, this is a great giveaway! i cannot live without a lip balm, but have not find my ideal one yet, currently i use labello lip balm. Korres Lip Butter in Pomegranate is my faaaavorite! twitter: @luciebeauty and tweeted about your giveaway! My fave lip balm is the balance me rose otto one! It's gorgeous. My fave is Nivea SOS balm, i always go back to this as it works! My favourite lip balm is Caudalie Lip Conditioner. My favourite lip balm is the Burts Bees Honey one in the tube, lovely stuff! My favorite is The Body Shop lip balm. At the moment I am using Badger lip and body balm in highland mint. What an amazing giveaway! I would love to enter please. I am a little lip balm obsessed and always have so many on the go! My current favourites are the MUA Love Hearts ones. My favorite lip balm is Palmers Coco Butter lip balm. My favourite lip balm is Burt's Bees mint lip balm. Hi, Sherrie! (I feel as if I'm talking to myself!) My favorite lip balm is plain old Blistex, at present. I follow you via GFC as Sherry Brooks and by Bloglovin' as the same. Thank you for the giveaway and congrats on reaching over 1000 followers; that's quite an accomplishment! My contact email is crystesmom (at) yahoo (dot) com. Hey..that is a wonderful giveaway. I am following with the name Apoorva Writes. BUDDHA BALM is the the best lip balm on the market and there is no close second. Just look at the ingredients in the Nivea you are giving away. Pure junk. Buddha Balm is flavorful and natural. Buy it online if you can't find int stores. My favourite lip balm is Palmers Cocoa butter. im abit boring and stick to nivea lip balm. Favourite lip balms are Aromatherapy Associates and Connock London. My favourite lip balm are the EOS ones, I hear Balmy have made some that are similar now but they're yet to be released and I'm sceptical about the flavours! My favourite lip balm must be the original Carmex in a jar! I follow your blog as apavlovsky. My favorite lip balm is Kiehls. My favourite lip balm is The Body Shop's Strawberry lip balm. The Nuxe is definitely up there on my list of loves, my my new favorite for keeping the cracked lips and corners away is pure Vitamin E oil applied heavily and then covered in a balm like Rosebud Salve, the old MAC Honey salve, or the Nuxe. I wask up with noticeably more moist lips. See original comment above re: Nuxe and pure Vitamin E.
My favorite lip balm is good old Vaseline. I like to keep it simple by sloughing off dead skins cells with a toothbrush and applying lashings of Vaseline to keep my lips supple. But it's also good for other dry skin problems and I love mixing pigment to create new lip shades. My favourite Lip Balm - Nivea lip balms. my fave lip balm is smith's rosebud salve! My fave lip balm is Carmex. Can't be good old Vaseline but at the minute I am loving the Rose Petal Salve that came in a Beauty Box. My favourite lip lam is PawPaw pappya balm, smells amazing and really nourishing. My favorite lip balm is custom aloe/vitamin E balm I buy from this amazing seller on Etsy. It's 100% natural so not drying or sticky... Worth the extra money, and I buy several at a time to get some savings on shipping. my fav lipbalm is Nivea lip balm "rose"
Awesome giveaway! I'm using EOS lip balm right now but my all-time favorite is Burt's Bees. I'm following on GFC. 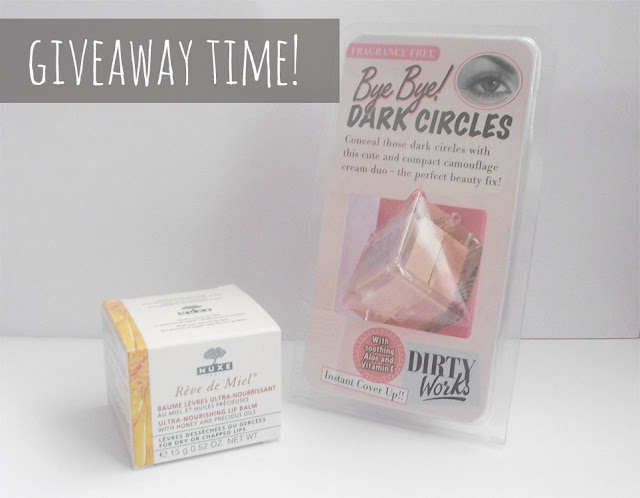 I woud love love loveee to win the byebye dark circles concealer! My current fav lip balm is the Pangea Organics Lip Balm in Pyrenees Lavender with Cardamom. My favorite lipbalm is Nivea Chery. Right now my favorite lip balm is dew kiss balm by avon. I love the pink color and how it feels on. My fave is Jelly Pong Pong lip cushion in Syrup.